Public companies need to address social issues if they want to win the trust of institutional investors, according to a new survey from Edelman. 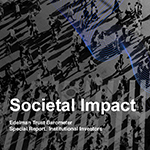 The Edelman Trust Barometer Special Report: Institutional Investors found that 98 percent of the investors surveyed think that public companies are obligated to address one or more social issues. Cybersecurity, income inequality, and workplace diversity were high on the list of issues that respondents cited as priorities. Investors also feel they should have a role in determining a company’s policies. Almost nine out of ten (87 percent) said their firms are more interested in taking an activist approach to investing, and an even larger number (92 percent) indicated that they would support a reputable activist investor if they believe change is necessary at a company in which they invest or recommend investing. Corporate culture is becoming a major factor as well. Almost two-thirds (65 percent) said that maintaining a healthy company culture and enforcing a corporate code of contact are key to the level of trust they have in a company. Overall, 89 percent of respondents said that their firms had changed their voting and/or engagement policy to take ESG (environmental, social and governance) risks into consideration, with 63 percent saying that this change has come in the past year. Another aspect of what the study calls “NextGen Investment Criteria” is the accessibility and reputation of a company’s board of directors. Nearly all (94 percent) of respondents said they must trust the board of directors before making an investment decision about a company. In addition, 92 percent said that access to the board is important, and 95 percent think that an engaged and active board is an essential feature. Digital channels are becoming a major way for investors to gather this information about companies, with 98 percent saying that they use such platforms as LinkedIn and Twitter to inform their investment decisions. Also, 86 percent indicated that an executive’s social media channels are used to help evaluate investments. The Edelman Trust Barometer Special Report: Institutional Investors was based on an online survey of 500 institutional investors in the U.S., Canada, UK Germany and Japan. The study was conducted by Edelman Intelligence between Sept. 9 and Oct. 22.